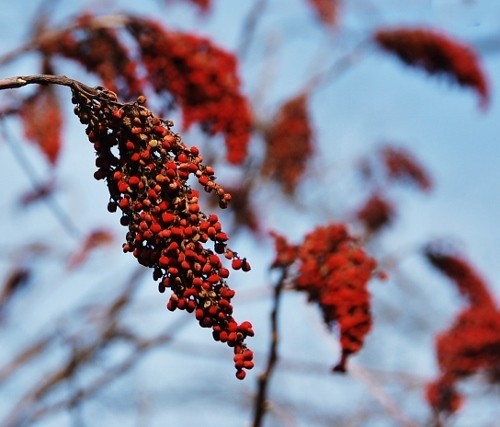 Other Names: Rhus hirta, staghorn, scarlet sumac, upland sumac, velvet sumac. The berries can also be used to make a natural dye…Do I feel another foray into the world of natural ink-making coming on? Love the red with pale blue sky background. Nah, the photographs of the red seed heads are so much tidier than a batch of red ink. But I am tempted to see how lemon-y they really taste. Because I love lemons and tart things. 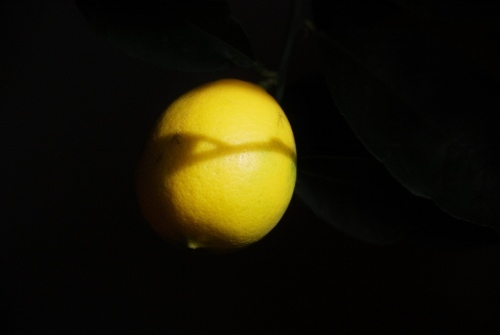 However, I don’t have much incentive to forage for tartness as I happen to have an abundance of my very own, homegrown Meyer lemons at the moment. They basically taste like regular lemons. Except 700 times better since I grew them myself. And for the record, they do seem more juicy than store-bought. I brought the little tree inside several weeks ago and I’m pleased neither baby nor puppy have destroyed it. This entry was posted in Art, Baking, Cooking, DIY, Fall, Food, Gardening, Humor, Kids, Missouri, Parenting, Photography, postaday, St. Louis, Vegan, Vegetarian on November 15, 2013 by Spy Garden. 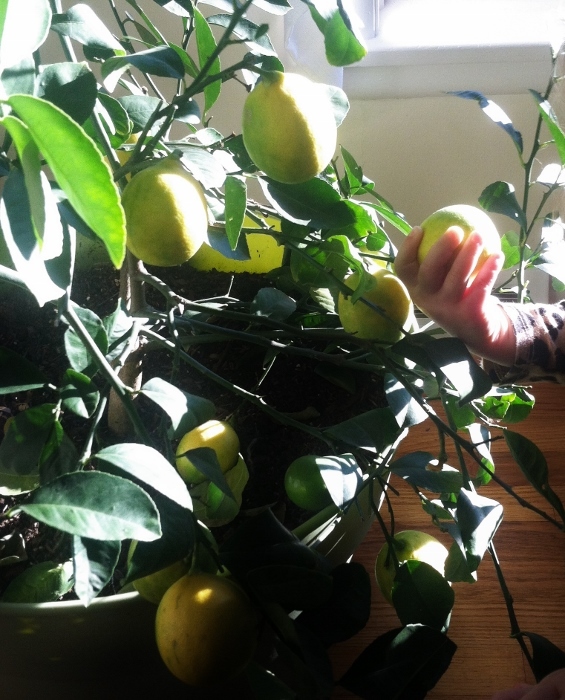 I *love* your lemon tree! And look at all of those lemons! 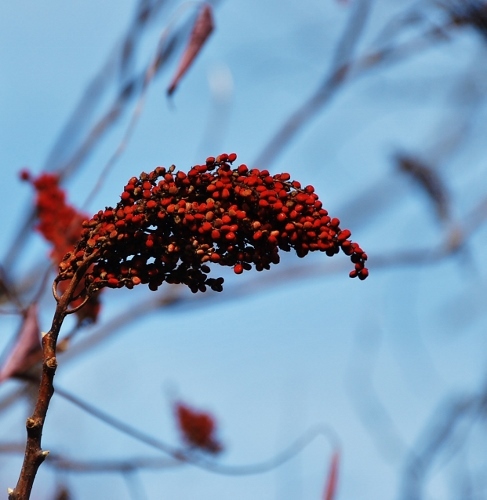 I remember being afraid of touching “poison sumac” while growing up in Poughkeepsie, NY. I’m not sure if we’d actually get a reaction like with poison ivy, but we never wanted to take the chance! 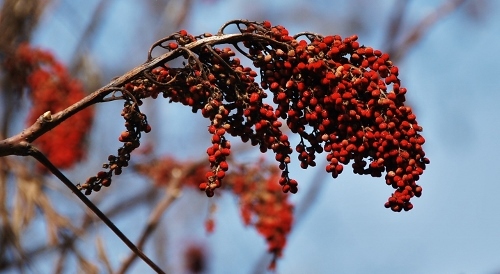 The good thing about poison sumac is that the berries are white, so it is very easy to tell the difference. Plus it only grows in swampy areas (which we are not in) so I haven’t seen any around here! 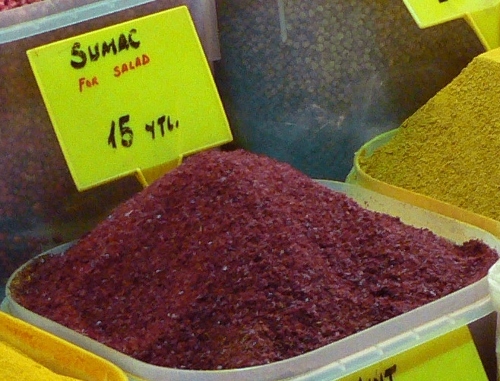 Ground sumac berries are like spicy vinegar flavoured powder. Absolutely delicious on hot chips (fries). As a vegan I don’t eat eggs. You might ask yourself why there are chickens all over Serendipity Farm…you might WELL ask yourself that. Consider it a moment of stupid madness when the synapses between my ears turned all “Country Romantic” and while I had them tuned on “English Country Garden” they injected chooks to the image. I stupidly fell for both the garden AND the chooks and now they are threatening to take over the world. Just so’s you know who is responsible for the “Great Aussie Chook Invasion” in advance that is. Ok I will “forage” some (I don’t have to go too far obviously) and try it! OMG so you let all the eggs hatch?! GAGAGAHAHAHAHHAHahaha That so sounds like something I would do. I actually REALLY want a peacock frolicking around the yard (just for looks). But I heard they make an awful noise. Which may ruin the unpleasant scene. I love chia seeds. They pack quite a protein punch but I’ve found that if you don’t rinse the blender immediately (when added to smoothies) the little beggars stick like glue to the glass.